Unique. 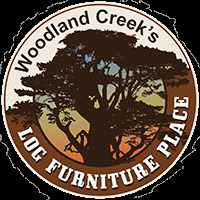 That is the best one word summary for our Aspen and Elk Antler Log Sofa Table. Or Wild. Wild fits pretty well too. Rustic... That embodies it in whole. Maybe there isn't just one word? The rustic sofa table is crafted out of hand peeled rustic aspen logs full of rich character. Aspen logs twirl around the large aspen legs to offer cabin decor charm and extra stability for the slab table top. The solid table top is wrapped in large aspen logs for a big rustic presence. A clear natural looking lacquer finish is applied to protect the wood. Then to add some wild cabin decor a massive elk antler stretches across the two legs adorning your sofa table and daring any other table to surpass it's rustic class. This is a sofa table that is hand crafted in the USA and that you will admire for life. Made proudly in the USA! !